What's a Hands-On Linux Demo? 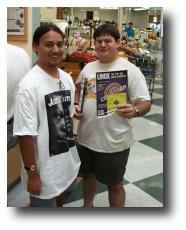 In September 1999, LUGOD held its first public demonstration of Linux at the Davis Farmer's Market. 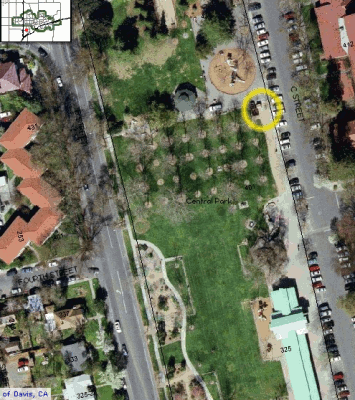 We've since held demos at other venues, such as the Davis Food Co-Op, and the Borders bookstore in Davis. We call our event a "hands-on Linux demo" because it's precisely that! We set up one more or computers running the Linux operating system and a nice desktop environment, and let people try it out for themselves. We show off popular Open Source applications, such as "The GIMP" (digital artists and photographers want to check it out), "OpenOffice.org", and "Firefox." We show games and K-12 educational programs. For people who use UNIX and want to try Linux, we show various low-level tools that are available. Volunteers answer questions about Linux, Open Source, LUGOD, and computers in general. We also take the opportunity to advertise LUGOD. We'll have handouts describing the club and our events, flyers for upcoming meetings and installfest workshops, and even plug our neighbor LUGs in Sacramento and Roseville. Along with information and flyers, we try to have CD-ROMs with software (Linux install discs, live-CDs, Open Source software for Windows, etc. ), and sometimes books, magazines, or other 'swag' and goodies. We give these items out for free! (If your company or organization wants to provide give-aways for our demos or other events, contact pr@lugod.org). We often burn these ourselves. Who Comes To A Demo? First, we aim to educate the public that there are good alternatives to Microsoft. We want to show people what Linux and Open Source are, and how well they work. Secondly, it serves as a very good way to advertise the LUG to people who already run Linux but may not know that there is a user group in the area. Thirdly, some people think LUGOD is "just a UCD organization." We're not! We're our own 501(c)7 non-profit, and our goal is to be a resource to the entire populace of Davis and the surrounding region. In the past, we tried to hold demos once a month, typically on a Saturday. These days, we do demos on their own far less often, however we still participate in other events, such as Whole Earth Festival, Software Freedom Day, and a LUG booth at LinuxWorld Expo. 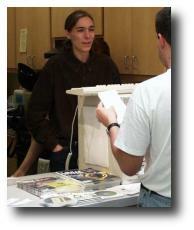 In June 2000, VA Linux Systems donated a PC to LUGOD for our demos and InstallFests. In January 2004, we received a mini-ITX system for a very reduced price from Dave Margolis, which replaced the old VA system. In late 2018, member Jens-Christian Lache graciously donated us two former Macbooks converted to Linux Mint, as well as an ASUS netbook, also running Mint! These machines are currently in service during Farmer's Market and Tech Cafe events. It's always encouraged and appreciated when volunteers bring their own hardware for demonstrations, including laptops, netbooks, Raspberry Pis, and other Linux-based devices. If you'd like to show off some equipment running Linux, and/or volunteer to man our booth, please contact the Demo Coordinator and/or one of our other officers.